UPDATE – After geting a new photo of the trail, Liam Bahneman told me he was now siding with it being his second choice, UPS902. Having reviewed the evidence, I fully agree that UPS902 is a much better fit than AWE808, especially when viewed against the composite photo. "Missile-like" contrail. Note this is the Dec 31st contrail, not the Nov 8th CBS one. That's at the bottom of the post. This contrail is no more vertical than the road is, and nor are the power lines at 45 degrees. Everything is horizontal – it’s the just the angle you are viewing it from. All of these show horizontal contrails. Secondly there’s the misconception of direction, that it’s flying away from the viewer, when it’s actually flying towards the viewer. This is because the “base” of the contrail seems wider than the tip. Perspective tells the brain that this mean the base is closer. But actually you can see the base has been greatly spread by the wind. Since it’s so far away the effects of perspective are greatly diminished, meaning the actual width of the contrail is what is creating the illusion. Imagine if a plane with a 100 mile long spreading contrail were coming towards you; what would it look like? It would look exactly like this. This diagram is not to scale, but the math is the same regardless. The solid curved line is the surface of the earth. The dot at the top is San Clemente. The little triangle is Catalina. “d” is the distance to Catalina (d=35 miles). “c” the amount of Catalina that is visible above the horizon (c=0.05 miles, really a bit more, but let’s be conservative). “a” is the altitude of the plane, (a = 6 miles). “r” is the radius of the earth (r=3963 miles). The green wavy line is the contrail. Notice it’s at a fixed height above the surface of the earth, and is going directly towards the OC. Looking at the satellite image for noon on that day (12/31/2009) and the next day (1/1/2010), we see contrails in approximately the same position, and around 100 miles long, showing it’s quite possible, given the right weather. The actual New Years Eve contrail, viewed from Santa Monica. 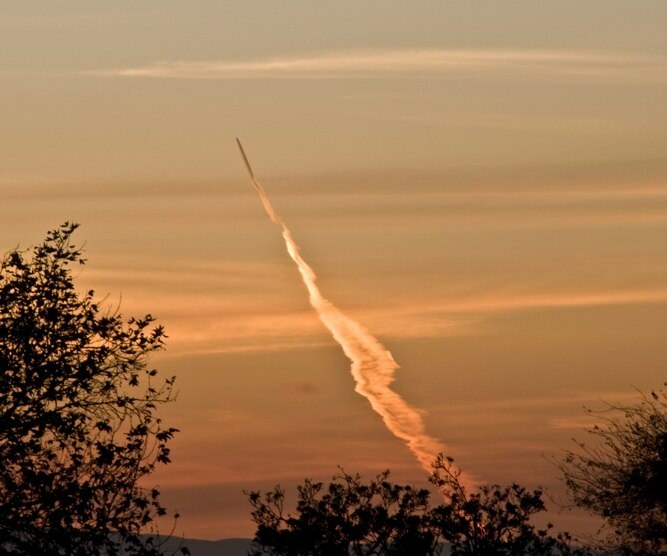 This is what the CBS "missile" contrail would have looked like to most people in LA, which is why nobody reported it. You can see from this angle (and taken a bit earlier) it looks far less interesting, as it’s very apparent it’s just a contrail. Scott Methvin sent in these two images which shows the contrail in all it’s missile-like glory, but from a better angle. Another angle on the New Years Eve contrail. See, it's all about perspective. Obviously not missiles. But look at sections of the trails. Not a missile launch, in Michigan. Now here’s the one everyone is actually talking about. From Monday Nov 8th 2010, this time it video taken a local CBS news crew in a helicopter, so they were able to zoom in. Jet contrail, misidentified as a missile launch, again. Note it’s pretty much in the same location. Note also it’s not exactly moving at missile speed. Note also it’s practically identical to the photos of plane contrails, above. Same as last time, maybe even the same scheduled flight. And once again millions of people failed to notice, because from any other angle it looked like what it was, a contrail, from a plane. Must be a slow news day, as this went all the way up to Jim Miklaszewski asking people at the pentagon about it. There are occasional flashes of light, which I think are reflections of the sun off a flat surface on the plane. There’s also portions of the video where a bit of the trail behind the plane seems to glow. I think thats just the last rays of the setting sun lighting that portion of the trail. See Scott Methvin’s photos, above for how the trail can be oddly lit from minute to minute. Here’s a better video. You can see after about 0:50 it’s out of the contrail-persisting region of air, and is just leaving a short contrail. It’s also now out of the sun. It looks exactly like the short contrails of a jet coming towards the camera with perspective foreshortening. The camera crew lost it in the darkness shortly after that. The most likely flight is US Aiways flight 808 from Hawaii to Phoenix. I snapped the above web image at around 5:05PM today, about the same time as the video was taken yesterday. And here’s a photo I took (Nov 9th) two minutes earlier from Santa Monica. I think it’s the same flight, just 24 hours later. Note that the angle is exactly the same as the Dec 31st contrail that produced the original “missile” story. Obviously the video would have to have been taken from way off to the right in this photo (I’m looking South West). The chopper would have been somewhere like Torrance. Cameraman Gil Leyvas shot video of a luminous point hurtling through the sky followed by a long vapor trail. 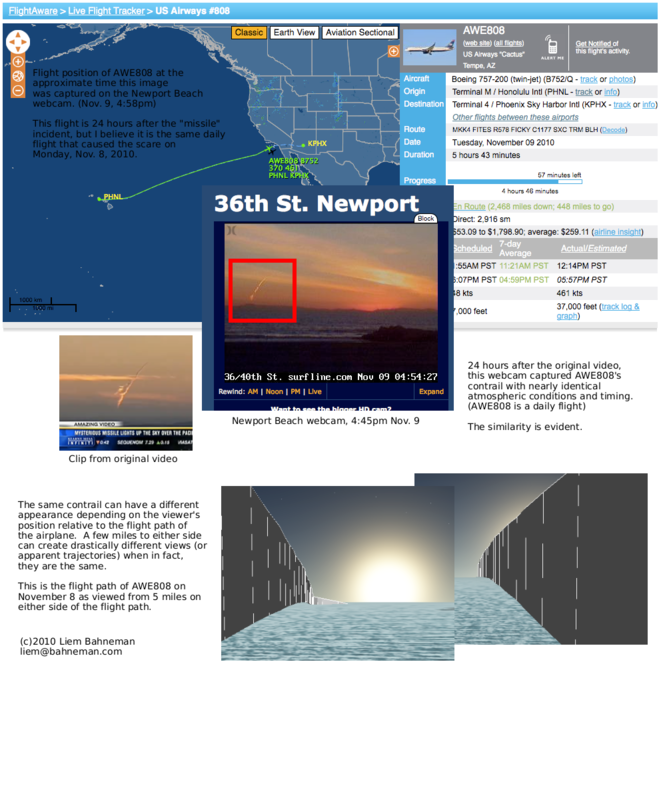 He said he was aboard the television station’s helicopter shooting footage of the sunset over the ocean about 5:15 p.m when he noticed the spiral-shaped vapor trail and zoomed in to get a better look. The onboard camera showed a plume twisting up from the horizon and narrowing as it climbed into the sky near Catalina Island, about 35 miles west of Los Angeles, he said. I suspect what he saw (which can only be what is on the video, I’d like to see it in HD) is the twisting of the contrails, this can be quite dramatic, especially from such a head-on angle. See this video of a similar perspective, and note the swirling twists in the contrails directly behind the jet. Here’s a grab from that video, showing the twist, and how it as accented by low sun. Twisting contrails in low sun. It’s too slow (<— biggest reason). There’s no expansion of the plume (as the chamber pressure exceeds the atmospheric pressure more and more during flight). There’s no sunset striations across the plume (which would look like this: http://tinyurl.com/2vklwu5). In the wide shot there’s two contrails (off each wing!) instead of one. The plume at the plane is twirling in different directions (very un-rocket-like). The plume at the plane is twirling too much — that only happens in the case of a motor burn-through, which is a failure mode, meaning it would be seconds from exploding if it were a rocket. The wind-blown plume is all wrong, vertical plumes go through several different wind shear layers, which makes it look very different than what the video shows. The apparent direction of the jet is a bit of an illusion, as the trail is greatly distorted by the winds at altitude, which can also vary greatly from place to place. At 37,000 feet the wind can easily be in the 50-100 mph range. Richard Warren of Los Angeles shot four close-up photos of the trail from a fixed position in Lon Beach. I’ve combined them here into one photo, where you can see the trail move with the wind, and the actual path that the plane takes is much more obviously passing to the south of Long Beach, matching flight 808. Richard took a fifth shot at a wider angle that shows the greater context. The jet is still visible as a dark speck (it’s still got a very short contrail). There’s also a very impressive crepuscular “edge” shadow that’s probably cast by part of the contrail that is over the horizon.